Too Faced Sweet Peach Palette - Just Another Overrated Eye Shadow Palette ? 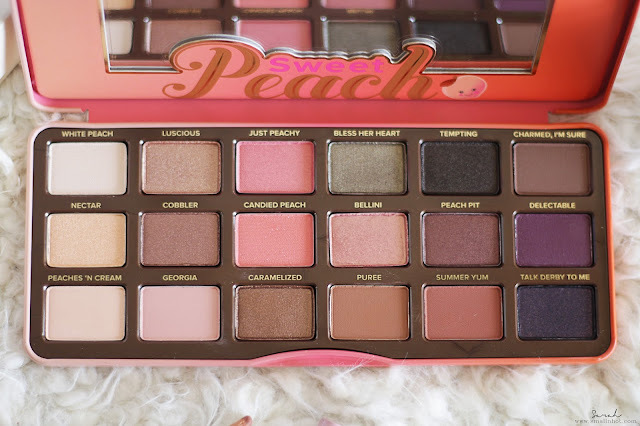 Too Faced Sweet Peach Eyeshadow Palette. Be sweet as a peach with these fresh-picked shades infused with the juicy scent and antioxidant-rich essence of peach. Create endless looks with 18 shades of peachy pink, corals, bronzes and pops of purples that will have you looking summer-fresh year-round. 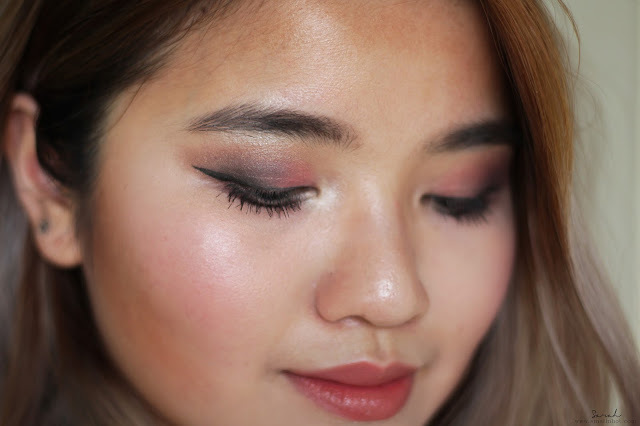 You'll LIKE it if peachy-scented and metal cased eyeshadow palette is your thing. You'll HATE it if you are looking for a creamy and pigmented eyeshadow palette thats worth your time and money. 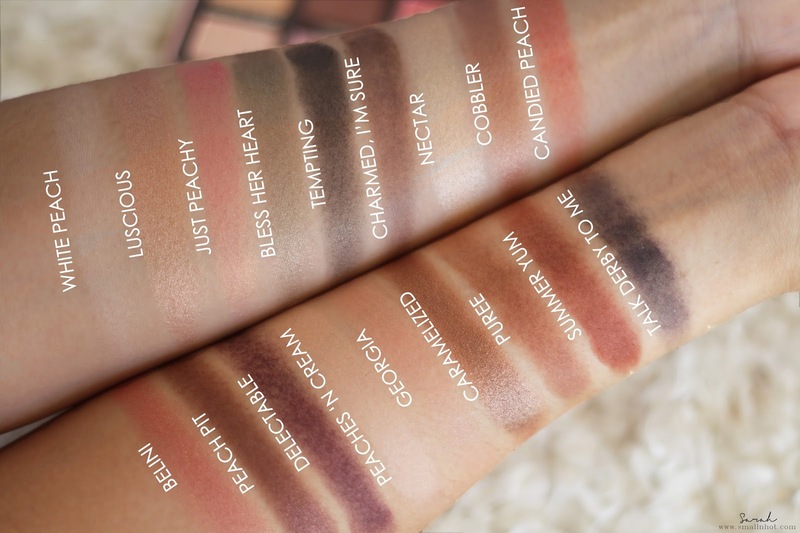 The Too Faced Sweet Peach Palette is a 18 shades palette with most of the lighter and warmer tones on the left whereas cool greens, blues and purples on the right. 7 mattes and 11 obvious shimmery shades with 2 that comes with some speck of pink glitter in it. Sure, their cute packaging and the whole peachy-scented eyeshadow does make a girl go googley, but if you're talking about the quality of the eyeshadow, it left me a terribly underwhelmed. For me, I have had heard a lot of people talking about this Sweet Peach palette and it took me a while before I decided to head down to Sephora to get myself one of this overly hyped palettes. So the excitement was incredibly high. But as soon as I played with the shades, I noticed the pigmentation was not the same as I would expect all mapped out in my mind. The colours are very pale especially those matte shades and it doesn't feel as creamy as a high-end makeup palette should be. Aside from that, never have I had to deal with patchy eyeshadow unless it's from a cheaper makeup brand. As you can see from the swatches on my hand, the "Delectable" and "Talk Derby To Me" was so patchy that I could barely make a smooth swatch with it. So imagine how much time It would take to blending the shades on my lid. 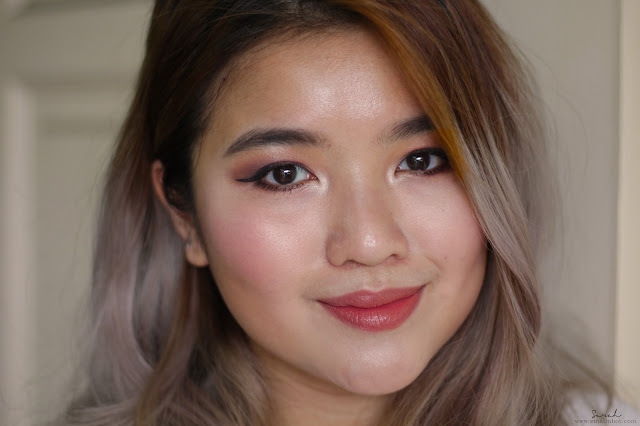 Anyway, I created a simple eye makeup look using only the Sweet Peach palette shades. Even after all the "Just Peachy" & "Candied Peach" shades layering, that's all the colour that is showing on my eyes. 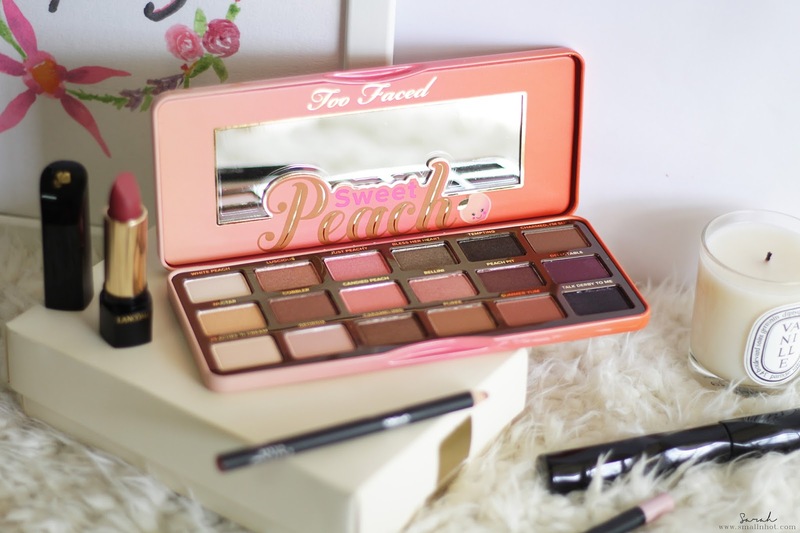 Overall, it's time to get this Too Faced Sweet Peach Eye Shadow Palette off the rave train as i'ts an overrated Eye Shadow Palette with very little substance. Social media has made it seem like it's the best but honestly, the pigment is lacking, eyeshadow fallout is comparatively bad and finishing is patchy. 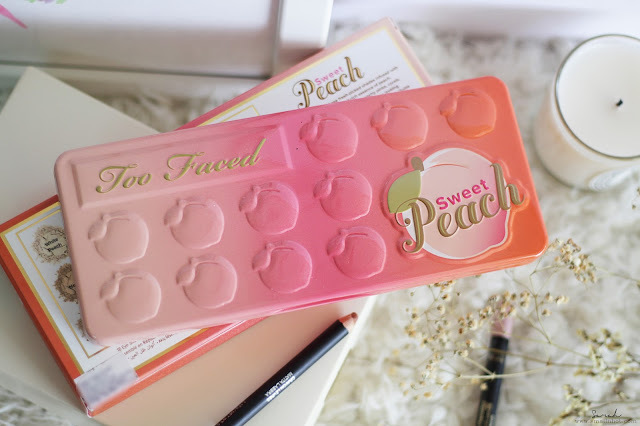 For the price of RM 199, you can get 2 Sleek Makeup Palettes and the pigmentation is way better than this Sweet Peach palette. If there's a money back policy at Sephora, I would be the first to stand in line.... Hope that this review helps, you save some money and time..